Illegal wildlife smuggling ranks just behind drugs and human trafficking as the third largest illegal trade—and only an estimated 10 percent of its trafficking is intercepted. Now, with unprecedented access to U.S. Fish and Wildlife agents, law enforcement, and more, accomplished environmental journalist Laurel Neme uncovers how forensic scientists are working to change that. Animal Investigators tells the story of often overlooked murder mysteries: the poaching and smuggling of endangered species. The greatest threat to the remaining wildlife in African rainforests is the illegal bushmeat trade – the murder of wild animals not to feed starving people but to feed the urban elite. Animal Investigators tells an amazing story about concerned scientists and forensic teams working to solve the murder mysteries that all too often are overlooked: the poaching and smuggling of endangered species. Animal Investigators provides an excellent account of how a little known group of dedicated scientists is providing a new and vital weapon in the arsenal of wildlife law enforcement officers. It is my hope that the telling of their fascinating stories will help generate the public support necessary to expand their efforts and the work of their colleagues and allies around the world. 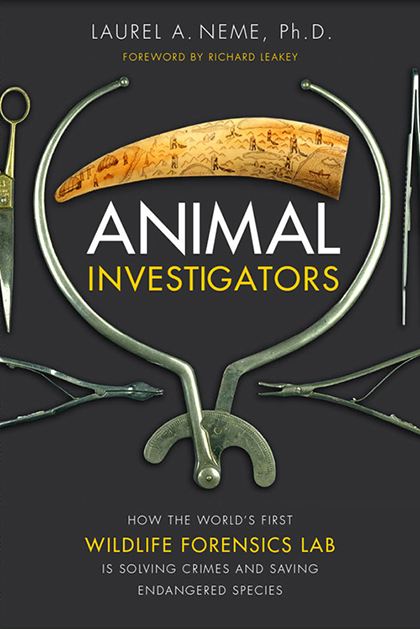 Animal Investigators is an excellent book, timely, well-written, and fascinating. And it gives important credit to the USFWS Forensic Lab which has in recent years done outstanding and critical work, as the cases in the book illustrate. I have been a little involved in the shahtoosh wool problem -- the wool of Tibetan antelope -- and the lab has been of critical help in distinguishing antelope from domestic goat. I wish the book well deserved success. I attended a major international workshop in Thailand last weekend, which brought together experts to consider wildlife crime in Asia. I took Laurel's book with me and read it in the evenings. The workshop participants acknowledged that several areas of wildlife crime are driven by organized and sophisticated criminal groups. In the meantime, Laurel's account of the work of Ken Goddard and his colleagues shows that some of the law enforcement community's response is also highly sophisticated and uses the latest research and technology. I wish there were more specialized forensic scientists and wildlife crime laboratories elsewhere in the world. However, what I think we need most is for wildlife crime to be seen as 'mainstream' crime and for it to receive the priority and attention that it deserves. I'm sure Laurel's work will help further that cause, reinforce the extent of the problems we face, and the effect they are having on biodiversity around the world. A fantastic, exciting and revealing read! Neme takes us deep into the dark world of wildlife exploitation with a level of thrill and suspense rivaling any episode of CSI, with one exception, Animal Investigators is far from fiction, as these genuine and mysterious crimes against nature are resolved by crafty and determined experts in the fields of wildlife conservation, law enforcement and management. Think CSI: Wilderness. Laurel Neme's book gives us a new set of heroes, in the labs of the Fish and Wildlife Service, and reminds us of one of the uglier set of villains on the planet, the traffickers in wildlife. Animal Investigators is not bad….it is outstanding!! My only complaint is that once I picked it up, I couldn’t put it down. I am so touched by your words about my work. Thanks for the recognition. Your book made my years of devotion worthy. I am impressed with the high level research you did. Congratulations for this outstanding piece of work. I hope thousands of people access your book. Persons like you will surely help saving our mates (wild animals) in our lonely planet´s journey. The moral case against wildlife trafficking has been made already. Animal Investigators is a stimulating account of what it takes to make the forensic case against wildlife and environmental crime. A new arsenal of techniques for thwarting the billion dollar global trade in illegal animal parts is emerging, just in time for the world’s endangered wildlife species.